Watermark in PDF Software can be placed on top or in background of page. PDF insert watermark to insert date, time, page number, images, logo, author and file name to PDF pages. 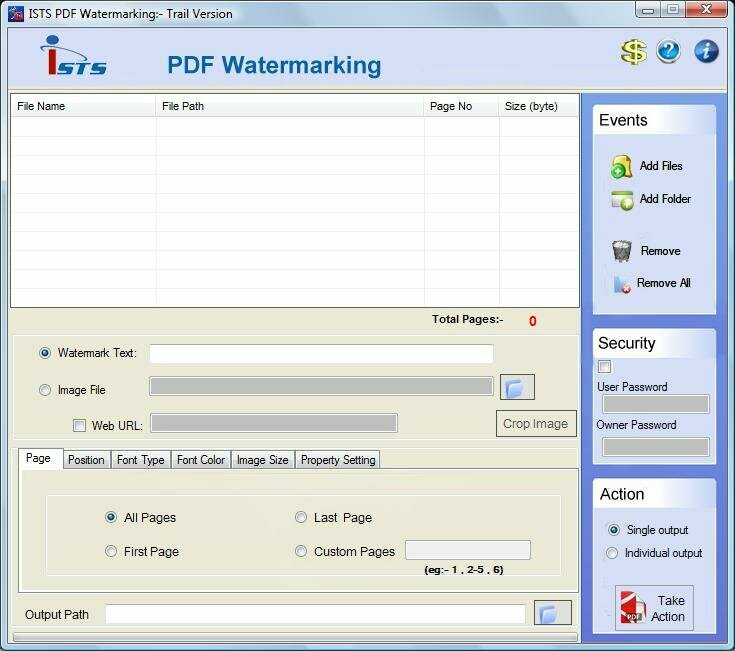 PDF watermarking application can be stamped behind virtually every PDF pages. PDF watermark tool can be stamped behind virtually every elements of a PDF file. PDFs Watermark has no limit to the amount of stamps you could apply to a single document and no limit to the amount of documents you can stamp, As special feature you can integrate PDF Stamp into programs. PDF Watermarking is the JPEG TIFF BMP JPG PNG GIF image support you can stamp company logos, author signatures, products, charts or any artwork in image format. Windows NT, Windows ME, Windows 2000, Windows 2008 (server), Windows XP, Windows Vista, Windows 7. Watermark in PDF for company logo, your name or Web address help to protect your PDF files. PDF watermarking has the ability to apply a text or image watermark to a PDF file. PDF Watermarking Features * PDF Watermarking Enabling you to easily position the text or image stamp in any location on the page. * PDF Watermarking supports links web links. * Add Watermark PDF supports image stamp. * PDF Watermarking can Create a PDF for reviewing purposes only you can apply a Review purposes only watermark text so that the recipient will know not to use it for anything else. * PDF Watermarking, PDF Stamp software & PDF Watermarks supports image stamp JPG JPEG TIFF PNG BMP images. * PDF Watermarking Crop images according to need and then put as watermark. * PDF Watermarking User can choose whether to overwrite the existing text of a PDF file when the watermark is create * PDF Watermarking Set password or properties of out coming PDF document. * PDF Watermark does NOT need support of any Adobe Acrobat software. * PDF Watermark software is easy to use work in single click. * PDF Watermarking & PDF Stamp pages using the standard Base 14 fonts and system fonts.